Where in the World is Mrs. Fucoloro? : Pantheon, oh Pantheon, what time is it? What a day! 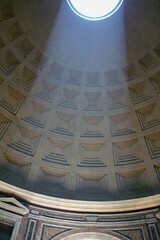 I was able to visit the Trevi Fountain AND Pantheon. Both experiences exceeded my expectations. I have found that it is a good thing if you think you know everything from pictures and that pictures can tell the whole story because then, you are never disappointed. Pictures may speak a thousand words, but you would need millions and still not do these amazing sites justice. This evening we have a private visit to the Sistine Chapel, I can not wait. Afterwards, we are going on a 'Rome by Night' tour. Much more later. Tour over tomorrow. Then, two days on our own.